The Food and Nutrition Technical Assistance (FANTA) Project undertook a clinical trial comparing nutritional recovery and mortality outcomes in children with severe acute malnutrition (SAM) receiving 1 week of amoxicillin, cefdinir, or placebo, in addition to usual peanut-based ready-to-use therapeutic food (RUTF) therapy. This report documents the outcomes of the trial, which clearly showed the benefit of using antibiotics in the outpatient treatment of SAM without medical complications in a setting with high levels of kwashiorkor and HIV infection. Nahar B, Hossain MI, Hamadani JD, Ahmed T, Grantham-McGregor S, Persson LA. Parenting programmes are effective in enhancing parenting practices and child development. This study evaluated the effects of a intervention with psychosocial stimulation (PS) on the quality of the home environment and mothers’ child-rearing practices in a community-based trial with severely malnourished Bangladeshi children. Severely underweight children (n = 507), 6-24 months of age, were randomly assigned to five groups: PS; food supplementation (FS); PS + FS; clinic-control (CC); and, hospital-control (CH). PS included fortnightly follow-up visits for six months at community clinics where a play leader demonstrated play activities and gave education on child development and child rearing practices. FS comprised cereal-based supplements (150-300 kcal/day) for three months. All groups received medical care, micronutrient supplements and growth monitoring. Mothers were given the Home Observation for Measurement of the Environment (HOME) inventory and a questionnaire on parenting at baseline and after six months to assess the outcome. 322 children completed the study. After six months of intervention the PS + FS and PS groups benefitted in the total HOME score (depending on the comparison group, effect sizes varied from 0.66 to 0.33 SD) The PS + FS and PS groups also benefitted in two HOME subscales: maternal involvement (effect sizes: 0.8 to 0.55 SD) and play materials, (effect sizes: 0.46 to 0.6 SD), and child-rearing practices scores (effect size: 1.5 to 1.1 SD). The PS + FS group benefitted 4.0 points in total HOME score compared with CH, 4.8 points compared with CC and 4.5 points compared with FS (p < 0.001 for all). The PS group benefitted 2.4 points compared with CH (p = 0.035), 3.3 points compared with CC (p = 0.004), and 2.9 points compared with FS (p = 0.006). Child-rearing practice scores of the PS + FS group improved 7.7, 6.4 and 6.6 points and the PS group improved 8.5, 7.2 and 7.4 points more than CH, CC and FS, respectively (p < 0.001 for all). Child-rearing practices of mothers of severely malnourished children and the quality of their home environment can be improved through community-based psychosocial stimulation with or without food supplementation. This may be of importance to promote child development. Since the turn of the 21st century ready-to-use therapeutic food (RUTF) has emerged as the preferred solution to treat acute malnutrition without complications. RUTF is a more appropriate technology than formerly prevalent powdered milk solutions because it enables outpatient care, simpler treatment protocols and production in the field. In this paper we analyze the forces driving the diffusion of RUTF as an innovation to treat child malnutrition and discuss the main features characterizing the new technological regime that results from its wide adoption. We combine the theoretical discussion and the review of secondary sources with insights from field research in Ethiopia, encompassing personal interviews with relevant parties and direct observation of how RUTF works in practice. This technology assessment exercise enables us to suggest some opportunities for policy intervention. Another less recent version of the same paper is available here. A simple invention can at times prove extremely useful. This is the case with Plumpy‟nut, a variety of ready-to-use therapeutic food (RUTF) conceived in 1999 that is shaping a new regime for emergency interventions to alleviate child malnutrition. This paper applies concepts from the innovation systems literature into the analysis of Plumpy‟nut with the aim of identifying the forces driving its successful diffusion as an innovation. Special attention is paid to three features that define the diffusion process: 1) shifting from inpatient to outpatient treatment, 2) building networks through licences, franchises and partnerships, and 3) exploring further varieties of application. We combine the theoretical discussion with insights from field research in Ethiopia, including personal interviews with relevant parties and direct observation of how Plumpy‟nut works in practice. The ultimate objectives of this technology assessment exercise are to better understand the innovation journey of Plumpy‟nut and to identify possible opportunities for policy intervention. Acknowledgements: An earlier draft of this paper was presented at the Globelics International Conference 2009 organized by CRES and UNU-MERIT (Senegal, October 6-8, 2009). Finally! Everything, really everything, about treatment of undernutrition (CMAM). In just-one-click-away, comprehensive, interactive, open-access, website. A new electronic forum improves the management of acute malnutrition. Worldwide. In this area of humanitarian intervention, CMAM is the acronym mostly used: Community-based Management of Acute Malnutrition. 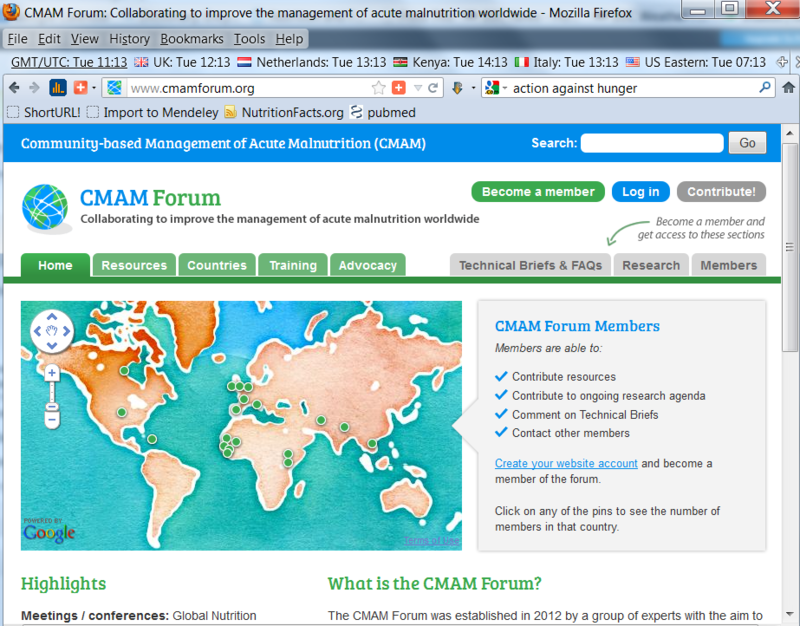 The CMAM forum not only hosts e-discussions about this topic, but also collects all the key documents endorsed by the WHO, other UN agencies, national and international NGOs. Otherwise scattered around, in their web sites. World experts in this field (Andre’ Briend, and Mark Myatt among them) support this forum. Therefore, the target consists of practitioners rather than the general public. This important forum was conceived thanks to the effort of many organizations. However, the realization was led by Valid International and Action Against Hunger. If you find the CMAM forum interesting, do not hesitate to re-blog this post, or forward the link of the forum to relevant people. Reducing child malnutrition requires nutritious food, breastfeeding, improved hygiene, health services, and (prenatal) care. Poverty and food insecurity seriously constrain accessibility of nutritious diets, including high protein quality, adequate micronutrient content and bioavailability, macro-minerals and essential fatty acids, low anti-nutrient content, and high nutrient density. Largely plant-source-based diets with few animal source and fortified foods do not meet these requirements and need to be improved by processing (dehulling, germinating, fermenting), fortification, and adding animal source foods, e.g. milk, or other specific nutrients. Options include using specially formulated foods: fortified blended foods (FBFs), commercial infant cereals, ready-to-use foods i.e. pastes/compressed bars/biscuits, or complementary food supplements (CFS): micronutrient powders (MNP); powdered CFS containing (micro)nutrients, protein, amino acids and/or enzymes; or lipid-based nutrient supplements (LNS), 120-500 kcal/d, typically containing milk powder, high-quality vegetable oil, peanut-paste, sugar, (micro)nutrients. Most supplementary feeding programs for moderately malnourished children supply FBFs, such as corn soy blend, with oil and sugar, which has shortcomings: too many anti-nutrients, no milk (important for growth), suboptimal micronutrient content, high bulk and viscosity. Thus, for feeding young or malnourished children, FBFs need to be improved or replaced. Based on success with ready-to-use therapeutic foods (RUTF) for treating severe acute malnutrition, modifying that recipe is also considered. Commodities for reducing child malnutrition should be chosen based on nutritional needs, program circumstances, availability of commodities, and likelihood of impact. Data are urgently required to compare impact of new or modified commodities to current (FBFs) and to RUTF developed for treating severe acute malnutrition. “Severe acute malnutrition (SAM) in children contributes to the deaths of 1 million children every year. Until recently, children with SAM were treated as inpatients in crowded hospital wards with milk-based therapy and routine antibiotics for all children. With the advent and widespread acceptance of peanut-based ready-to-use-therapeutic food (RUTF), standard therapy for SAM without medical complications is to treat these children at home. Even in the home setting, international guidelines recommend that children receive a course of oral antibiotics at the start of their RUTF therapy. Because this places an additional burden on already taxed health systems and caregivers, because clinical experience has shown good recovery rates without antibiotics, and because the bacteria most likely to cause severe infections in these children are unlikely to be susceptible to most options for routine antibiotics, their routine use has been called into question. Thus, FANTA undertook a clinical trial comparing nutritional recovery and mortality outcomes in children with SAM receiving 1 week of amoxicillin, cefdinir, or placebo, in addition to usual RUTF therapy. This report documents the outcomes of the trial, which clearly showed the benefit of using antibiotics in the outpatient treatment of SAM without medical complications”. Journal of Nutrition – May 2012. Ahead of print.